This week we're revealing our sunroom. Its creation, as part of the overall cottage reversion, was critically important: having scanned the rental market, we quickly observed that most contenders benefit from a porch of some variety. Can we be honest? The ongoing transformation at Plan B is killing us. That which we though would be an ambitious undertaking is turning into a renovation of almost biblical proportions: one that's rendered us emotionally fraught and bereft of energy at every turn. So you've seen our lakeside project unravel in these virtual pages -- and our televisual story line is half way there -- but the monolithic reno' trajectory literally tore at our very being, physically and emotionally, at every turn. Whilst leaving our budgets in virtual chaos. But we battled on, saving money wherever possible, and spending it where we had to. This week we're revealing our sunroom. Its creation, as part of the overall cottage reversion, was critically important: having scanned the rental market, we quickly observed that most contenders benefit from a porch of some variety. Whether a luxurious bug free garden room, a well appointed three season conservatory or a simple screened solarium, it was perfectly clear that, somehow, we needed to embellish our wee shack with an indoor outdoor space. Our cabin, essentially, needed to magnify to properly capitalize upon its underlying potential. Without further ado we entered dialogue with Nicole Sokol and Shaun Hunter from Discovery Dream Homes without whose valuable input, it should be reported, our sunroom ambition might never have materialized. Courtesy of their experience -- and their ability to liaise with the planning department -- our dreams started to realize as we appraised the company's 3D "walk through" renderings and exacting technical drawings. Take a tip: master draughts person qualifications and the skill set required to untangle technical specifications are beyond most people. Whomever you choose to work with when it comes to your own project, ensure they're as technically enabled as Shaun and Nicole. Ask for references and request to see a catalogue of work to back up any claims they make as to pedigree. From the very beginning, Discovery Dream Homes were thoroughly transparent, even inviting us to view properties upon which they'd previously worked. This bred immediate confidence that didn't once slip as the project gathered momentum. Appraising the scheme (and mindful of his unstinting efforts in other zones) it was decided that, to ease the pressure on our principal contractor Randy Blain, we should engage a third party to help with the actual build. Having worked with the team at Toronto based Mason Brothers Construction on previous GTA projects, we agreed they'd be the perfect fit, especially being that they were willing to travel. As the wider cottage project endures, Dave Mason and his fastidious crew stay on to build our bunkie (just wait till you see that!) and, with the assistance of Randy and Discovery, the sunroom comes together without any significant glitch. That which particularly impressed us was the way MBC eased into -- and around -- our existing team, and the way they problem solved every single hurdle without missing a beat. Framing the new porch, a 12' x 17' space with a coursing wedge shaped ceiling, was first order of service. 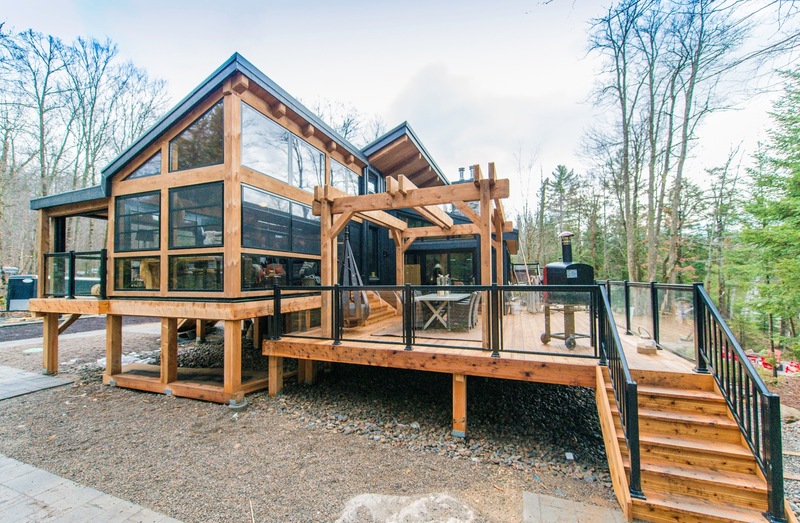 Positioned to deliver amazing sightlines to the twinkling waters of Drag Lake, the structure is anchored to the wrap around deck, itself set stoically into the ground on concrete piers. Floored with granite the pine-framed monolith leads directly off the kitchen, making it the ideal place in which to enjoy pre or post dinner drinks, sundowners or overspill chatter space when the main cottage is busy. 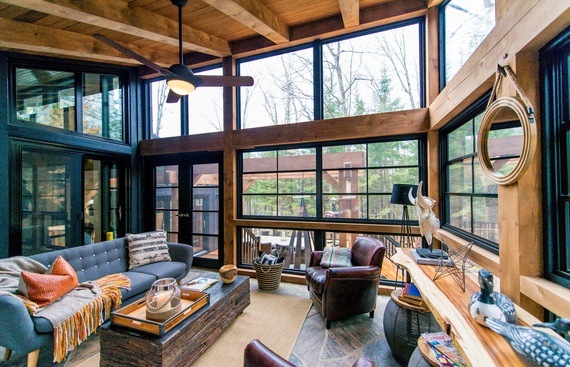 To optimize vistas, we specified Weather Master Sunspace screens whose memory vinyl "glazing" remains impervious to wear and tear no matter how inclement the conditions. Hey, you can literally punch the vinyl and it slowly "corrects," undamaged. Fitted by Nortech they provide a precise, tailored aesthetic as viewed from inside or out. What's more, stackable up and down for air circulation (aided by the softly rotating blades of an overhead Fan Shoppe fitting) the black framed panels feature "invisible" mesh to ward off entomological attack. Take it from us -- attention to detail such as this is critical if you're to properly enjoy time at the lake. Build complete, the room comes alive with leather chairs and a Mid Mod style sofa in soft grey tones. Weighty charm is delivered in spades courtesy of an Artemano coffee table and a console that accommodates beautiful hand carved Loons, bagged in the local craft store. As always, our schemes are a mix of indulgent and affordable -- final anchoring detail comes from an Ikea rug and a selection of cushions and throws found in Marshalls and Winners. 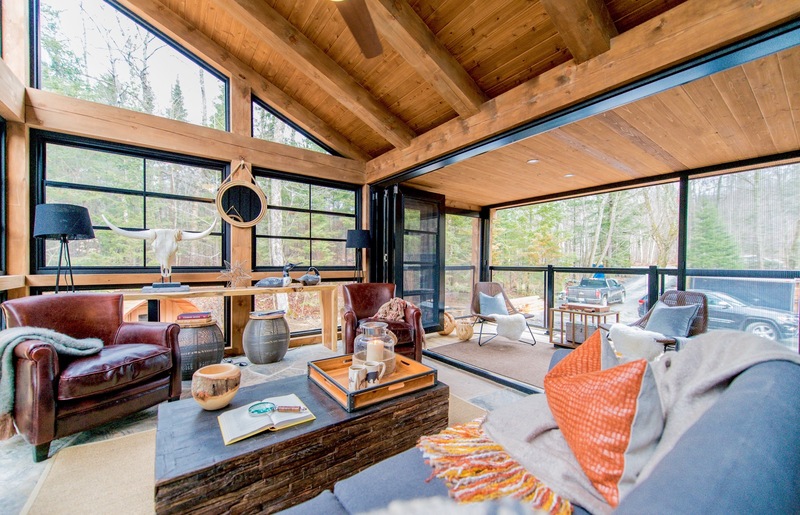 To amplify the indoor/outdoor vibe, we added a clever annex (accessed directly from the sunroom through stackable Weather Master Plus doors, again by Sunspace) which adds a whopping 13' x 10' of additional living space. SlideClear pleated screens -- from the same supplier -- expand and contract from a low profile "cartridge," effectively creating insect proof "walls" that slide around three elevations. 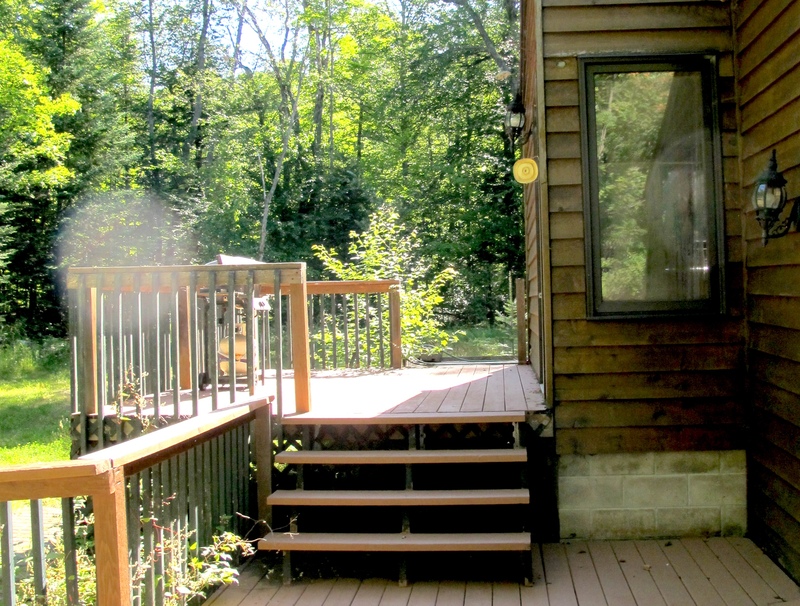 Further insect protection comes courtesy of microscopic mesh, discreetly installed under the deck boards -- attention to detail such as this means the little nook can be enjoyed even with bug season at its most invasive. To furnish, we added inexpensive weatherproof loungers from Ikea and a $20 side table from the Haliburton Thrift Warehouse: complete, the space serves as terrific spill over when larger groups gather. The barometer's red arrow already rising, it's proving to be a very big hit: Scottish friends, visiting only this week, declared it their favourite space in which to soak up the holiday vibe. If you like the images showcased here, join us Sunday at 9 p.m. when we'll be showcasing our dual space sunroom in exacting detail. And next week, in these virtual pages, we'll be revealing our recently formed basement, a wildly ambitious guest bathroom and a quirky laundry bedecked in antique style European tile. All will be revealed! Colin and Justin's Cabin Pressure airs on Cottage Life (network is currently in free preview) at 9 p.m., Sundays. Colin and Justin are also resident judges on W Network's Game of Homes, a competition series that will see the eventual victors win a fully furnished house, and plot of land. 10 p.m., Tuesdays.